Status: Rare casual summer visitor. Documentation: Photograph: 5 Oct 1958 Loup River, Howard Co (Lemburg 1980, Bray et al 1986). Taxonomy: See discussion under Mallard (Taxonomy) for relationships between members of the North America monochromatic mallard group and Mallard. Relationships among the “southern Mallards” (Johnsgard 1975) have lacked consensus. Johnsgard (1975) listed three groups of “southern Mallards” as subspecies of Mallard: A. platyrhynchos maculosa, breeding mainly along the Gulf Coast, A. p. fulvigula, restricted to Florida, and A. p. diazi, breeding mainly in northern Mexico. Currently, most authors recognize the Florida and Gulf Coast populations as subspecies of Mottled Duck A. fulvigula; a genetic study by McCracken et al (2001) supports this treatment. Banding studies show no genetic interchange between the two populations, and that the few recoveries northward on the Great Plains have been only from the Gulf Coast population (Baldassarre 2014). This suggests that Nebraska Mottled Ducks are of the Gulf Coast subspecies A. f. maculosa. There is evidence of hybridization between Mottled Duck and Mallard in the Great Plains from Kansas to Oklahoma (AOU 1998) and the western Gulf Coast (Ford et al 2017); Andrews and Righter (1992) noted that specimens listed as Mottled Duck by Bailey and Neidrach (1967) had been found to be “probable hybrids” and did not consider Mottled Duck a valid species on the Colorado list (but see Comments). Thompson and Ely (1989) did not indicate any evidence for hybridization in the small breeding population of Mottled Ducks at Cheyenne Bottoms, Kansas, a possible source for Nebraska occurrences. 5 Oct 1958 Loup River, Howard Co, female, photograph (Lemburg 1980). The first record consists of a photograph of a female that was injured by a hunter 5 Oct 1958 on the Loup River in Howard Co (Lemburg 1980). Identification from the photograph and the lack of evidence for hybridization was confirmed by Paul Johnsgard (Silcock et al 1986; Bray et al 1986). 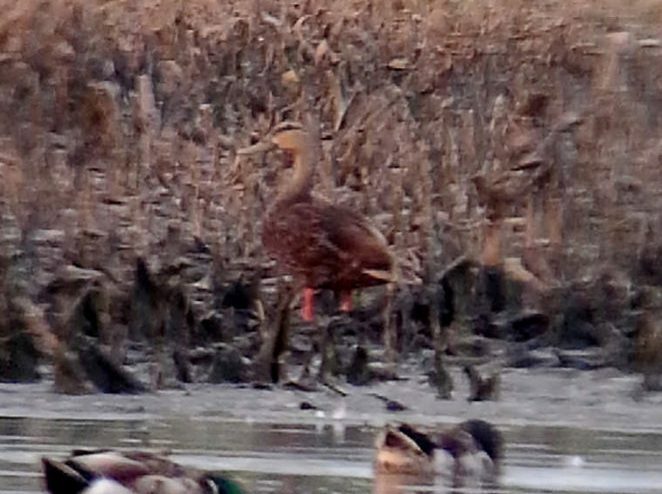 The second record was of one first seen at LaPlatte wetlands, Sarpy Co 7 Jul 2014 and identified as a female or juvenile of this species (Brogie 2015); it was reported through 11 Jul and probably left around 14 Jul as the flooded fields dried rapidly. See American Black Duck for spring and summer reports in Nebraska that might in fact be of this species. Comments: Primarily a Gulf Coast species, Mottled Duck is considered “casual in the Great Plains region from Nebraska south…” (AOU 1998). Thompson et al (2011) described its occurrence in Kansas as “Currently a rare visitant… formerly bred at Cheyenne Bottoms “. Earlier, Thompson and Ely (1989) considered it a “spring to fall resident” (15 Feb-30 Nov) at Cheyenne Bottoms. It apparently bred there “at least 1963-1977”; about 12 pairs were recorded in 1966 (Thompson et al (2011). One banded in Louisiana was shot by a hunter in South Dakota (Will Selman, personal communication). The single Colorado record is 28-30 Jul 2013 in Morgan Co (CBRC 2017). Photograph (top) of a Mottled Duck at LaPlatte Bottoms, Sarpy Co 12 Jul 2014 by Michael Willison. American Ornithologists’ Union [AOU]. 1983. The AOU Check-list of North American birds, 6th ed. Allen Press, Lawrence, Kansas, USA. Bailey A.M., and R.J. Neidrach. 1967. Pictorial checklist of Colorado birds. Denver Museum of Natural History, Denver, Colorado, USA. CBRC [Colorado Bird Records Committee]. 2017. Mottled Duck records. Colorado Bird Records Committee database, accessed November 2017. Ford, R.J., W. Selman, and S.S. Taylor. 2017. Hybridization between Mottled Ducks (Anas fulvigula maculosa) and Mallards (A. platyrhynchos) in the western Gulf Coast region. Condor 119: 683-696. Johnsgard, P.A. 1975. Waterfowl of North America. University of Indiana Press, Bloomington, Indiana, USA. Lemburg, W.W. 1980. Mottled Duck. NBR 48: 88. McCracken, K.G., W.P. Johnson, and F.H. Sheldon. 2001. Molecular population genetics, phylogeography, and conservation biology of the mottled duck (Anas fulvigula). Conservation Genetics 2: 87-102. Silcock, W.R., T.E. Bray, and B.K. Padelford. 1986. Mottled Duck in Nebraska. NBR 54: 39-40. Thompson, M.C., and C.A. Ely. 1989. Birds in Kansas. Vol. 1. University of Kansas Museum Natural History Publications Educational Series No. 11, Lawrence, Kansas, USA.